The stock market closed sharply higher today following the U.S. Fed central banks decision to start tapering by reducing the rate of QE money printing from $85 billion to $75 billion per month. The immediate reaction by the stock market was to ADD near 300 points to the Dow, breaking back above the 16000 level to close at 16,168. Clearly a lot of traders had followed the media taper tantrums hype and gone short into the announcement, so approx 50% of the rally is as a consequence of short covering so probably the stock market will trend lower during the next few trading days. Also this further confirms my expectations for a trend for RISING interest market rates during 2014. So, yes the Fed has started to taper, but in my opinion all they are doing is marginally slowing down the over heating money printing presses as we remain a long way from halting QE let alone unwinding the mountain of QE to date. Meanwhile bitcoin suffered another heart attack today as it homes in on my first target of $500 (05 Dec 2013 - Bitcoin Mania Bubble Bursts, China Triggers Price Crash Start, Technical Forecast ), ultimate target is $15! 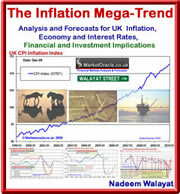 The mainstream media, financial sales industry and blogosfear were once more found to be on the WRONG side of the trend as near a years mantra of being convinced that the stock market would immediately throw a taper tantrum on the news that the Fed's announcement to start withdrawing QE easy money, that would off course obviously result in a bear market or even a stock market crash that turned out to be just as worthless as the mantra of non existant deflation has been of over the past 5 years! Similarly now expect the media with the benefit of hindsight to be full of reasons why the stock market soared instead of plunging such as that is a sign of economic health or that $10 billion reduction is much less than it could have been whilst completely missing the big picture that the Fed is STILL inflating asset prices by $75 billion per month that is being LEVERAGED! My view has remained consistent since March 2009, that's right MARCH 2009 ! 15 Mar 2009 - Stealth Bull Market Follows Stocks Bear Market Bottom at Dow 6,470 (112775 Reads). We remain in one of the greatest stocks bull markets of all time that looks set to continue into 2014 as I wrote over a month ago. 1. Target a rally to above 16,000 by late December 2013. 2. For the rally to continue to above Dow 17,000 into March 2014. The latest price action confirms forecasts expectations for the Dow to be trading at above 16,000 during late December and also despite a probable volatile January remains on track for a rally to beyond Dow 17,000 into March 2014, therefore I see no reason for another in-depth stock market analysis at this point in time. Also illustrated by the video version of the forecast below, that acts as a timely reminder of the crash is always coming mantra nonsense such as that of John P Hussman's highly regurgitated article of early November warning of a 40-55% crash just as the stocks bull market was bottoming following its last correction. 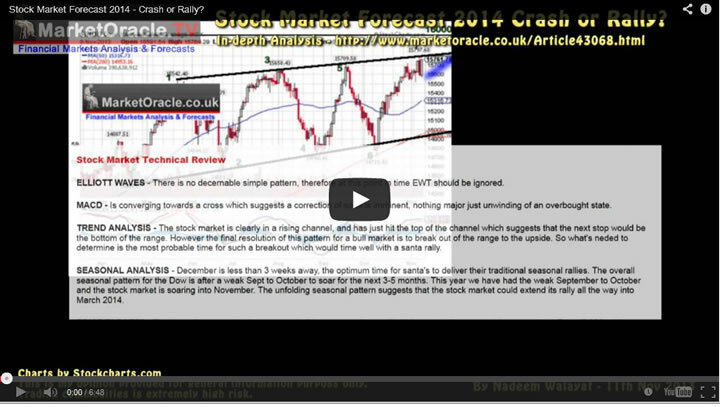 Ensure you remain subscribed to my always free newsletter for an ongoing series of in-depth analysis and concluding trend forecasts emailed straight to your in box. At least when Bernanke writes his memoirs in 20 years time he will be able to say he started to do the right thing and saw what was coming etc, but in the overall scheme of things it is just gesture politics. One thing Iam starting to notice is that during bull runs every bit of news is regarded with a posisitve spin regardless and likewise when something is in decline no news is ever good enough. Look at Gold, down when tapering was off the table and still down now it is on! you mention in your previous books that China has a great potential for an investor. Is now is the time to enter?